TOPEKA – Every day in Kansas, too many children are riding in the wrong car seats or are completely unrestrained, leaving them at risk of serious injury or death from vehicle crashes. To help combat the issue, statewide organizations and agencies, including Safe Kids Kansas, the Kansas Department of Transportation, and the Kansas Highway Patrol are partnering to promote Child Passenger Safety Week, a campaign dedicated to helping parents and caregivers make sure their children ride as safely as possible, every trip, every time. Child Passenger Safety Week runs September 13-19 and is sponsored by the U.S. Department of Transportation’s National Highway Traffic Safety Administration (NHTSA). Motor vehicle crashes are a leading killer of children. Car seats, booster seats, and seat belts can make all the difference. In 2013 in the U.S., 263 children under age 5 were saved because they were in child restraints. Having the right car seat installed and used the right way is critical. In 2013 there were 70 motor vehicle crash injury hospital discharges and 13 motor vehicle crash injury deaths among children 14 years old and younger in Kansas. While the state-wide estimate of motor vehicle restraint use among Kansas children (0-17) continues to increase (approximately 87 percent usage), the vast majority of child fatalities were unrestrained in the vehicle. “Too often, parents move their children to the front seat before they should, which increases the risk of injury and death,” said Cherie Sage of Safe Kids Kansas. “The safest place for all kids under 13 is in the back seat of the car. Also, according to NHTSA, about 24 percent of children ages 4 to 7, who should be riding in booster seats, were prematurely moved to seat belts, and 9 percent were unrestrained altogether. NHTSA recommends keeping children rear-facing as long as possible up to the top height or weight allowed by their particular seats. Once children outgrow the rear-facing only infant car seat, they should travel in a rear-facing convertible or all-in-one car seat. 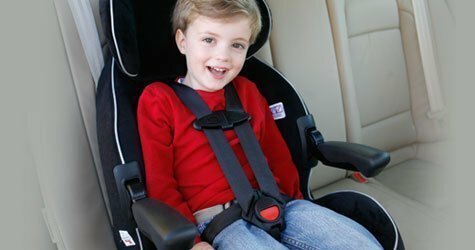 When children outgrow the rear-facing size limits, they are ready to travel in a forward-facing car seat with a harness and tether. After outgrowing the forward-facing car seats, children should be placed in booster seats until they’re the right size to use seat belts safely. Always remember to register your car seat and booster seat with the car seat manufacturer so you can be notified in the event of a recall. Parents and caregivers can view more information on car seat safety and locate a certified technician at www.safercar.gov/parents. To have car seats checked by a certified child passenger safety technician, visit www.kansascarseatcheck.org to schedule an appointment at an inspection station.